The 2017 Honda Civic Sedan is one of the most popular cars in its class thanks to its diverse features, powerful performance, and outstanding fuel economy, just to name a few. If you’re looking for a versatile car that’s great for cities, road trips, and everything in between, the Civic Sedan is perfect for you. The 2017 Honda Civic Sedan comes in five trim levels: LX, EX, EX-T, EX-L, and Touring. The base LX trim comes with a 2.0-liter inline four-cylinder engine and a six-speed manual transmission or optional CVT with the performance at 158 horsepower and 138 lb-ft of torque. The base trim is super fuel-efficient at 40 mpg highway and 32 mpg combined* for the manual transmission and 34 mpg combined for the CVT. The EX-T trim comes with a 1.5-liter turbocharged engine with 174 horsepower and 167 lb-ft of torque, even better fuel economy at 42 mpg highway and 36 mpg combined. The Civic Sedan has tons of standard interior features from automatic climate control to steering wheel-mounted controls for easy, eyes-free access to the radio. The EX trim gives drivers Push Button Start and a LED Gear Selector Indicator feature. The EX-T has Dual-Zone Automatic Climate Control, while EX-L has leather accents, an automatic-dimming rearview mirror, and heated front and rear seats. Get standard projector-beam halogen headlights, integrated LED bars in the taillights, and a security system with remote entry in the base LX trim, or upgrade for Smart Entry, a Power Moonroof, heated side mirrors, LED turn indicators, and more. Standard Bluetooth HandsFreeLink and a 5-inch color LCD screen are the highlights of the LX trim. Going up one trim gets you Honda LaneWatch, 7-inch Display Audio with Hi-Res Touchscreen, Honda Link with Android Auto and Apple Carplay, and Honda Satellite-Linked Navigation. For active safety, get the Touring trim, which comes with Collision Mitigation Braking System, Road Departure Mitigation System, Lane Keeping Assist System, and more. The Civic Sedan comes with plenty of standard safety features like Vehicle Stability Assist with Traction Control, Brake Assist, a Multi-Angle Rearview Camera, and TPMS. The 2017 Honda Civic Sedan is one of the safest cars in its class and earned an IIHS Top Safety Pick rating**, so you know you’re getting a car that you can trust to keep you and your family safe, especially if you opt for the driver assist features. 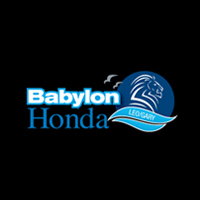 Come to Babylon Honda in Babylon, NY today and take the new 2017 Honda Civic Sedan for a spin! **2017 Civic Sedan w/ available Honda Sensing® has been award the TOP SAFETY PICK rating from the Insurance Institute for Highway Safety(IIHS).